There she goes again singing “Let it Go” from the other room for the 15th time today! You think to yourself, my child has a decent voice for her age! Is it time to get her a singing teacher? Research has shown that kids are physically and emotionally ready for formal music lessons between 5 and 7 years of age. Read on to learn five of the most amazing benefits voice lessons can have for your kids. When children are young, their brain is still molded by the skills they learn. This can cause the brain to develop faster and get healthier! 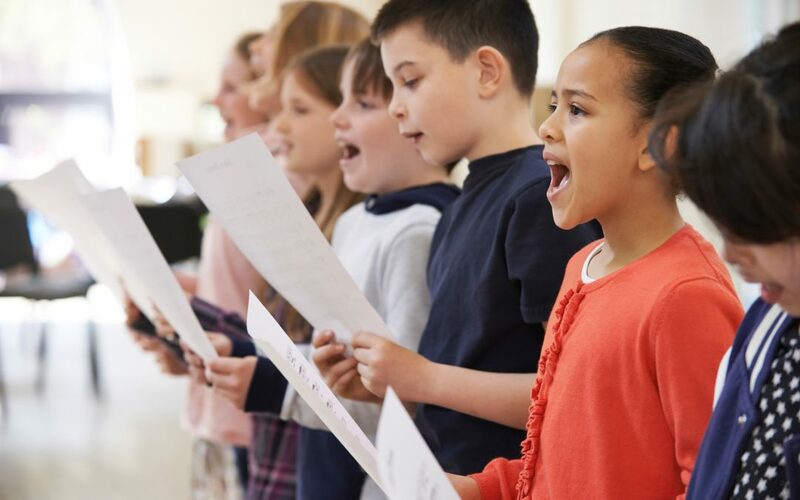 If they are taking voice lessons, their brain actually changes and allows the child to have skills like better memory and better motor skills. Studies also show that children test several points higher on both IQ tests and standardized tests after they begin music classes. The development of the left side of the brain from music classes also translates to improved language skills because both functions are in that hemisphere of the brain. On top of that, kids can learn music in other languages. They can also learn about those cultures, which helps expand their horizons. For example, by singing an Italian song, your child will learn phrases in that language and some information about the Italian culture as well. Children who take music classes learn to develop their social skills as well, especially when in a group class setting. They learn to work with peers in order to harmonize and make one beautiful sound. On top of that, music classes add a great self-esteem boost when they see how well they are progressing and get good feedback from their peers and teachers! When children learn to read and understand music, they also are better able to solve multistep problems in areas such as engineering, math, and computers. Research has shown that kids who can read music can actually visualize complex math problems better and have increased spatial-temporal abilities. They can identify patterns and recognize relationships between things better when they are also skilled in understanding written music. Neuroscience research has shown that when children are taking music classes, their brain actually functions better! Learning music makes the child use more of their brain, which actually makes the structure and pathways of neurons more efficient. Think of the brain as a muscle. When you work on a muscle group, it builds a bigger muscle that works better. The same thing happens to your brain during music lessons! Where Can I Find Voice Lessons? There are often music facilities near you that offer all kinds of music lessons including voice lessons. No music facility near you? Is your schedule too packed to squeeze in a regular music lesson? There are other options that will work for you too! There are also teachers who give lessons online via downloadable lessons or using video meeting software to do one on one lessons in real time. If you still have questions about getting your child into voice lessons, get in touch with us so we can help!